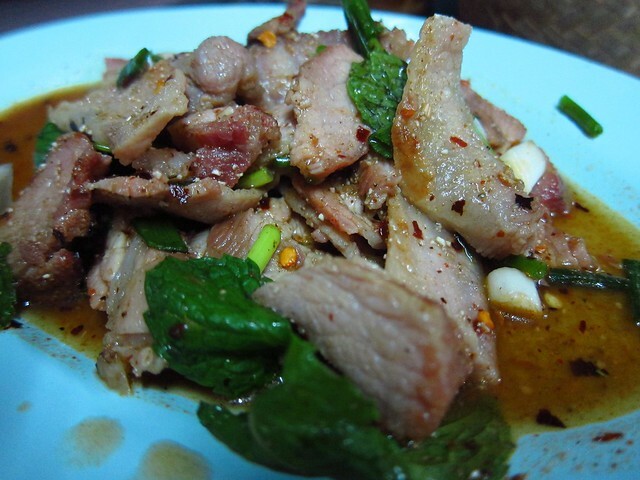 The great thing about eating in Bangkok is you never have to look very hard for delicious food. 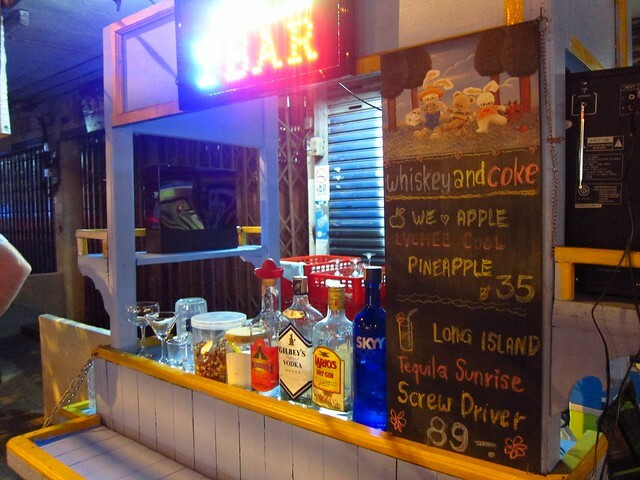 There are stands and makeshift restaurants on every street corner selling all kinds of yummy snacks, from the ubiquitous and filling pad thai to roasted crickets to coconut-based desserts. 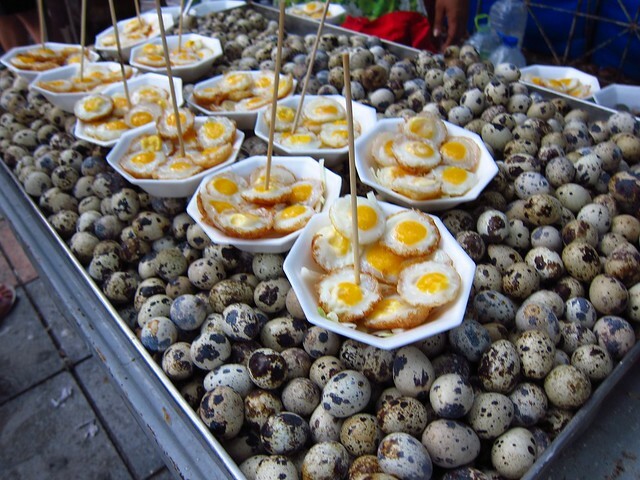 Here is a sampling of the food we grazed on as we wandered the streets of Thailand's capital. 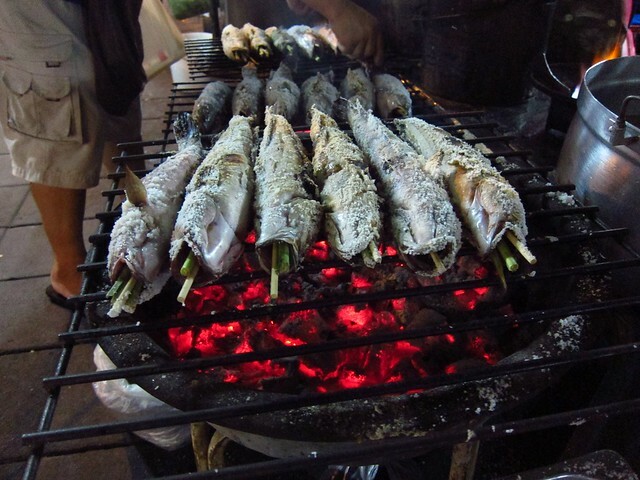 We spent an evening doing a food tour on Rangnam Road (near Victory Monument) after seeing an article in Travelfish that made our mouths water. By the end of our little tour we had eaten a noodle and veg soup with roasted pork, a roasted pork salad with sticky rice, margaritas, and a dessert that consisted of a green tea shake poured over soft white bread cubes and topped with condensed milk (tasted better than it sounds!). 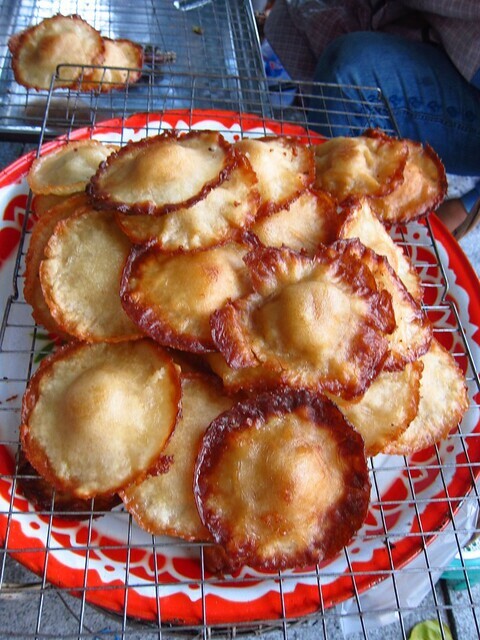 Next up were these thick, fried pancakes (about $0.30 each). 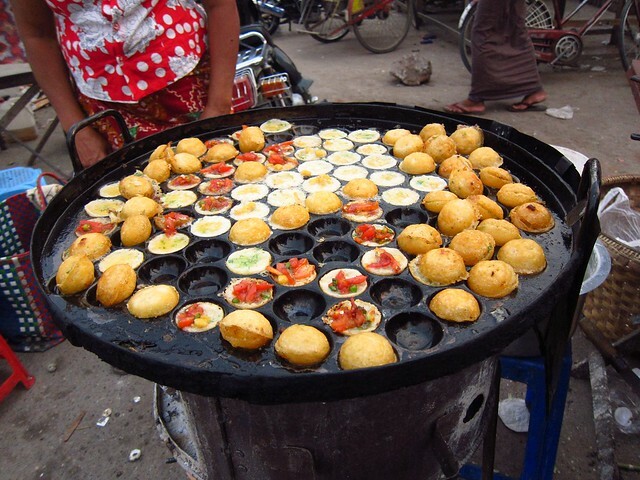 There's nothing in the center-- they just pop up like that while being fried. 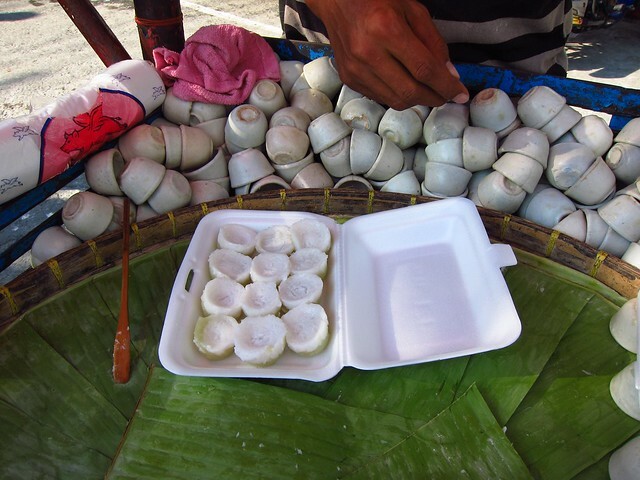 These little snacks were coconut-based desserts had a texture somewhere between jelly and pudding. They're steamed in tiny porcelain cups and then scooped out and sold by the dozen (for about $1). 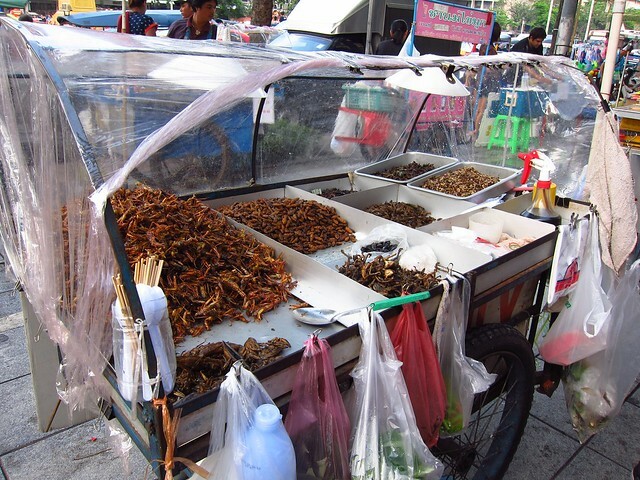 Finally, here's a snack we did not gather enough courage to try: roasted bugs. Nick was actually quite close to trying a grasshopper (or was it a cricket? ), but right before he ordered, he saw the pile of 2-3 inch long locusts (which looked like Texas roaches to me), and quickly bailed on the whole idea. Thankfully! 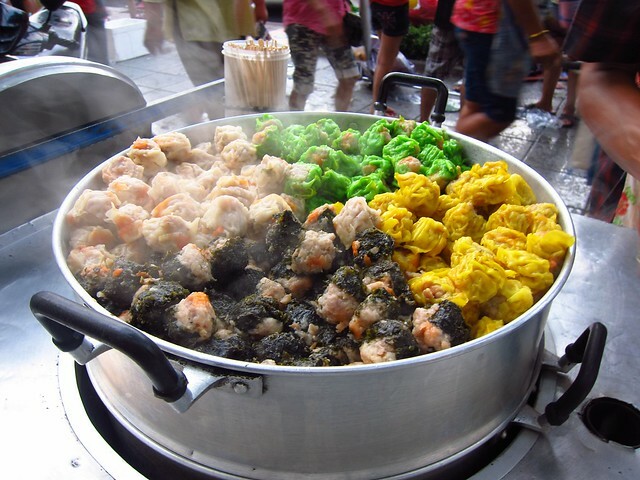 Bugs aside, if you're ever in Bangkok, don't bother eating at the restaurants-- grazing on street food is much more fun, cheap, and delicious!